Since the age of 13, Doug Bolton has dealt with symptoms of Charcot-Marie-Tooth disease (CMT), a neuromuscular disorder. CMT has paralyzed him from his knees to his toes, and from his elbows to his fingertips. However, Bolton’s disorder has not taken away his ability to fulfill his love for competing in sports. Bolton, 41, is a 1996 Grandview High School graduate who has pushed his body to the limit by competing in a number of athletic activities. He has competed in triathlons, including the Capital of Texas Triathlon, a national event for para-athletes, which Bolton raced against athletes who qualified for the Paralympics. Bolton occasionally uses a wheelchair in his personal life. He also wears a device called an ankle foot orthotic (AFO) to help him walk. With Bolton’s condition, he can become fatigued by overexerting. Without his leg braces, he can walk up to about 500 feet before getting tired, adding that his braces allow him to walk about a mile without feeling completely fatigued. Over the years, CMT has progressed to the point where it has affected Bolton’s ability to work. He said he can still write, but added that it’s difficult to type. Bolton loves biking so much that he participated in Biking Across Kansas (BAK) seven times. BAK is an eight-day bicycle tour across the Sunflower State. occasionally riding his bike about 100 miles on the Katy Trail from Pleasant Hill to Windsor. With no feeling below his knees, riding a bicycle is a challenge for Bolton. Bolton’s feet are clipped into foot pedals while riding his bicycle. “If I don’t have pedals that keep my foot in place, my feet just flop off,” he said. Bolton also enjoys swimming. He competed on the Grandview swim team from 1993-1996. “Swimming has always been something that I’ve done to help me stay competitive, and also to keep my health up,” he said. Bolton has also competed in cyclocross, which is raced on a circuit spanning one to two miles. “You’re in the grass, in the mud and in the rocks. You have to dismount and climb hills and jump over barriers,” Bolton said. In October 2017, Bolton made the decision to participate in his first team sport activity. 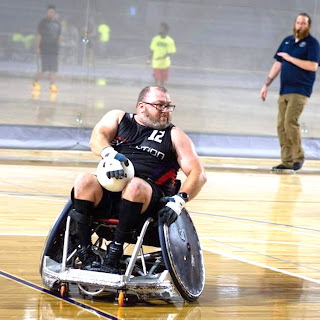 He joined the Kansas City Revolution Wheelchair Rugby Club, playing games at the Hy-Vee Center, formerly known as Kemper Arena. Hudspeth added that Bolton brings a positive attitude to the team. Bolton’s interest in the sport began after meeting a man at a bike store, who was getting a tire changed on his wheelchair rugby chair. “I started asking questions,” Bolton said. He instantly fell in love with wheelchair rugby after deciding to give the sport a try. According to Bolton, players who participate in the sport have disabilities such as a spinal cord injury, amputations or neurological disorders. Although traditional rugby and wheelchair rugby share a similar name, the two sports are quite different. Bolton said each wheelchair rugby chair costs $5,000 to $10,000. He raised about $1,000 to buy his and paid for the rest out of pocket. The Kansas City Revolution used money raised to play in a national tournament called the Wheelchair Rugby Metal and Muscle Tournament from Friday, December 7 through Sunday, December 9, in Houston, Texas. Bolton only played a few games, but he was proud of getting the opportunity to compete on the national stage. “It allowed me to be validated for all the training I did over the last year,” Bolton said. He enjoys participating in wheelchair rugby, because the sport allows him to be around other people with disabilities. One of Bolton’s favorite memories of the sport came in his first practice with the Revolution. Bolton’s eagerness to compete has allowed him to travel to new places and meet many para-athletes along the way. He likes hearing stories about how other para-athletes deal with their disabilities and he enjoys sharing his story. Bolton urges others with disabilities to never give up on their dream of playing sports. Bolton is always looking forward to his next athletic challenge. His goal in the next year or two is to compete in the Redman half Ironman Aquabike event in Oklahoma, which is a 1.2 mile swim and a 56-mile bike ride. Back in 1988, young entrepreneur Ty Yano opened his first McDonald’s restaurant in Grandview, Missouri, after moving to the area from California. 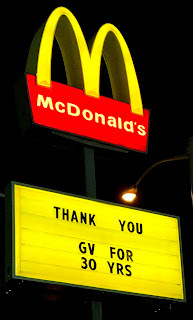 Since that time, Yano has acquired a dozen more restaurants, and has sold a countless number of hamburgers and French fries to the communities surrounding his stores. Believing in promotion from within, Yano has provided employment and advancement opportunities for his crew. Many began their careers under Yano’s direction, working their way up to management positions in the company. 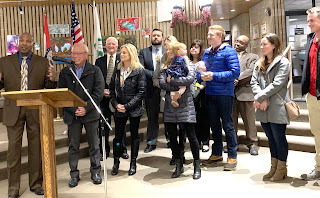 In recognition of owning and operating the McDonald’s restaurant in Grandview for 30 years, Mayor Leonard Jones and the Board of Aldermen presented Yano with a proclamation during their meeting on Tuesday, November 27. As he was preparing for retirement and more time to enjoy his family, Yano sold each of his restaurants. 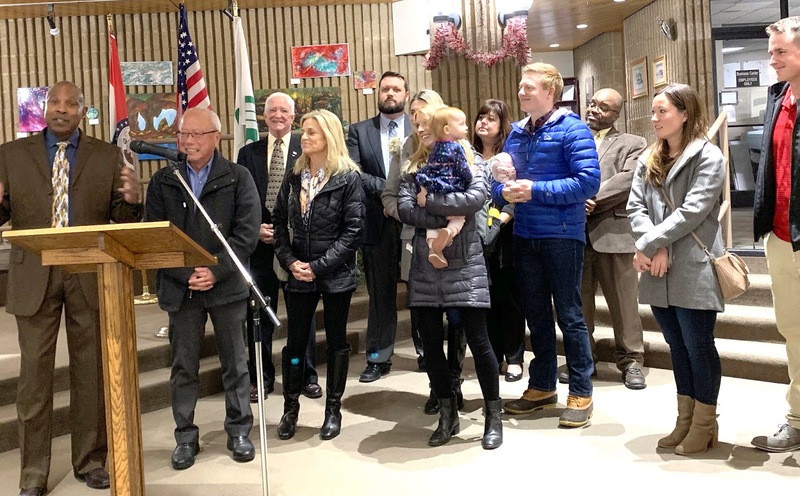 Over the last three decades, Yano has been a generous community supporter, with financial donations going toward many area nonprofits including the Grandview Education Foundation and Grandview Assistance Program. He has provided support for Music on Main and Harry’s Hay Days, to name a few.